Received the following from Kermit Geary Jr.
JACKSONVILLE, Fla. - Dec. 19, 2012 - CSX today announced the following organization appointments effective January 1, 2013. Gary Bethel, currently vice president-Mechanical, has been named vice president-Northern Region, succeeding Craig King, who is retiring.� He will report to Cindy Sanborn, vice president and chief transportation officer.� He holds a bachelor's degree in business administration from Ohio University. Frank Lonegro, currently president of CSX Technology, will succeed Bethel as vice president-Mechanical, reporting to Oscar Munoz, executive vice president and chief operating officer.� Lonegro will continue to have responsibility for CSX's implementation of the industry-wide Positive Train Control initiative.� He holds a bachelor's degree in political science from Duke University, as well as a law degree and a master's in business administration, both from the University of Florida. Kathleen Brandt, who currently leads the integration of the company's major operating departments and initiatives, will become president of CSX Technology, also reporting to Munoz.� She holds a bachelor's degree in computer information systems and a master's in business administration from Jacksonville University. "We continue to build on the strength of our team by putting proven leaders on point for key functions while aggressively developing people for the future," said Munoz.� "Gary, Frank and Kathleen represent the best of both of those efforts, and we are delighted to have them in these new roles." Not a bad Saturday morning in Three Bridges! with a favorable morning sun and the knowledge that a loaded ethanol train was coming down the LEHL, I decided to wait for it at a familiar haunt of mine, Three Bridges (LEHL; MP 48). After 22V passed by, 66Q was next up to come down the pike. 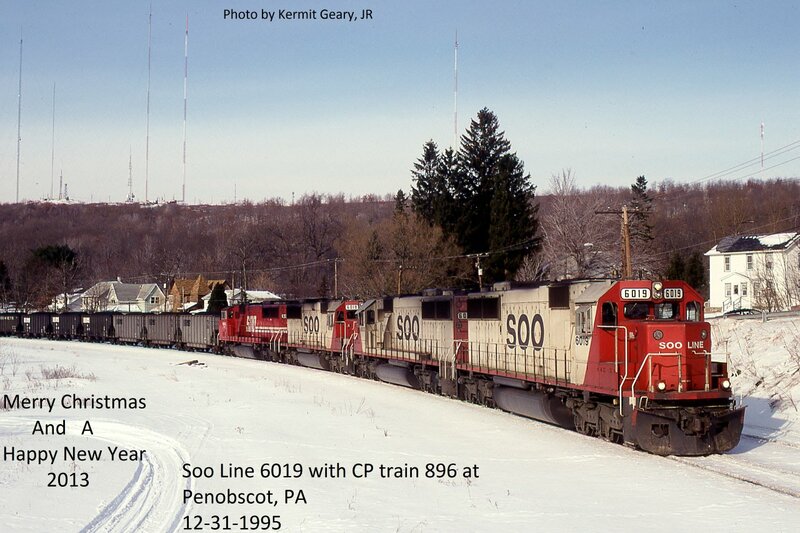 The motive power consisted of NS 9253 sporting the "Operation Life Saver" on its flanks, NS 8981 and UP 6393. After that train passed, BR&W's 1202 was shuffling cars around and managed to grab a shot of it crossing the Main Street grade crossing. For me the was an hour well spent. NORFOLK, VA. – A locomotive simulator, a vintage double-decker dome car, and “Brainy,” a public safety mascot that encourages people to “train your brain to be smart at railroad crossings,” are some of the attractions Norfolk Southern will feature Tuesday, Dec. 11, at a public ceremony to welcome Amtrak’s Inaugural Whistle Stop train to Norfolk at Amtrak’s new passenger platform at Harbor Park. The event, organized by the City of Norfolk and held in conjunction with Amtrak, Norfolk Southern, and the Virginia Department of Rail and Public Transportation (DRPT), begins at 2:30 p.m. and concludes at 6 p.m. It is open to the public. Norfolk Southern worked in partnership with Amtrak, DRPT, and CSX to bring passenger service back to South Hampton Roads by making improvements to the NS line that mostly parallels U.S. 460 between Norfolk and Petersburg, Va., where the route connects with CSX for same-seat service to Washington, D.C., and beyond to Boston. With Amtrak Virginia, the new round-trip service will bring intercity passenger rail service to Norfolk for the first time since 1977. JACKSONVILLE, Fla. - December 3, 2012 - CSX Corporation today announced that the Kingsboro Industrial Sites in Edgecombe County, North Carolina, are the first recipients in the state to receive CSX Select Site designation. CSX's Select Sites program reviews manufacturing and distribution development sites along the CSX network that can rapidly utilize freight rail service. This designation confirms that standard land use issues have been addressed and that the site is ready for development. 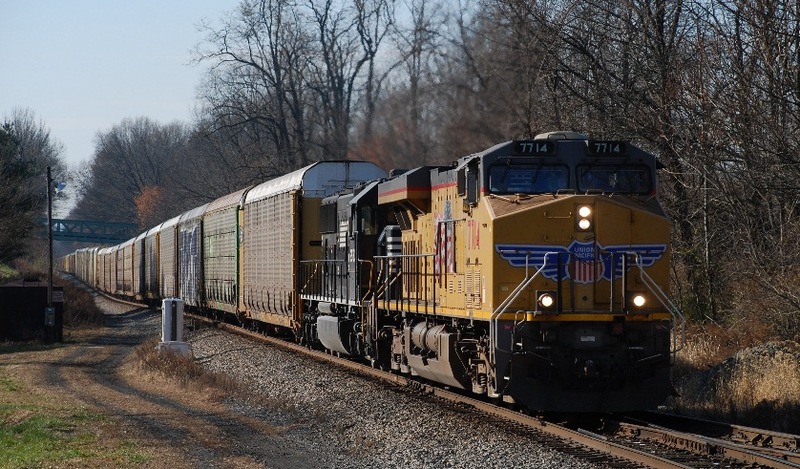 "Through Select Sites, we can provide increased speed to market and lower up-front development risk for companies seeking industrial property for manufacturing operations," said Clark Robertson, assistant vice president, regional development, CSX. "This program helps communities identify sites that can compete effectively for new investments and job creation." "The Kingsboro Industrial Sites are a rare find," said Jonathan Gemmen, location consultant, The Austin Company. "With increasing demand for rail services, we were surprised to see this available group of large, rail-served industrial sites adjacent to an interstate quality highway. The sites are flat and cleared, and the utilities are adjacent to the property with ample capacity." CSX introduced the Select Sites program in January to better serve customers in their own backyards by adding rail transport access routes for some of the premier manufacturing properties in the eastern U.S. CSX partnered with The Austin Company, a nationally-known site selection and certification consulting firm, to screen candidate sites and assist communities with the application and certification process. To receive CSX Select Site designation, the location must meet a rigorous list of criteria. Once certified, the sites are also featured on a new user-friendly web portal featuring press releases, promotional materials and direct marketing to site selection professionals. CSX would like to thank the Carolina Gateway Partnership, Edgecombe County, Edgecombe-Martin Cooperative, Golden Leaf Foundation, and NC Eastern Region for their financial support to complete the Select Site work. 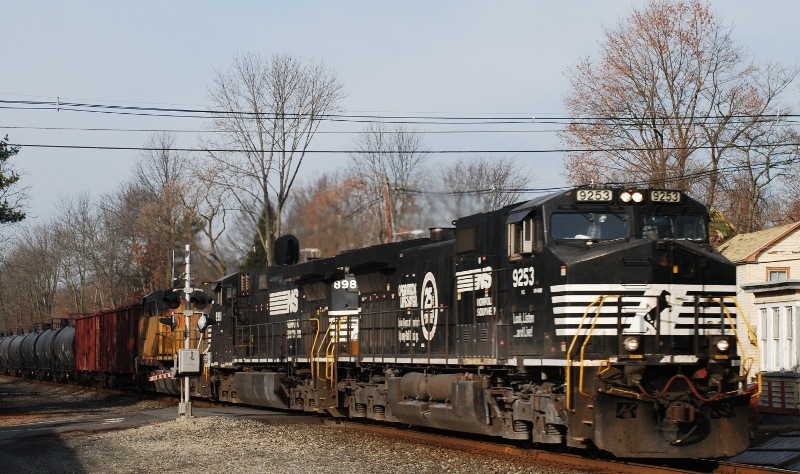 In addition to the Kingsboro Industrial Sites, CSX has certified six other sites located in Ohio, Illinois, Indiana, Kentucky and South Carolina. Received the following via email from the Garden State Division of the NMRA. The Garden State Division is doing something a little different. If you did not know it, 2013 is the Division's 50th Anniversary. We thought we would start the celebration off with a custom decorated “HO” Scale boxcar from Accurail. Take a quick look at the car in the attached flyer. Now, look again. If you thought it was a CNJ car in the Red Baron/Coast Guard scheme, you thought wrong. It only looks like a CNJ car. We substituted the Garden State Division logo and reporting marks for the CNJ's. The car is printed with 1963 as the car number, the year of our founding. The car will also come with a decal for a second number, 2013. Both numbers celebrate the Garden State Division's important milestone. If you want a Garden State Division commemorative car, or more, for your own, please complete the attached flyer and mail your check for the cost of the car and shipping to Bob Dennis, as instructed in the flyer. Quantities are limited, so you will want to move fast! Link to GSD flyer for 50th Anniversary car. NORFOLK, VA. – Norfolk Southern has completed a major upgrade to its Lamberts Point export coal transload facility in Norfolk, positioning it to remain the largest and fastest coal transload facility in the Northern Hemisphere. More commonly known simply as Pier 6, the facility transfers coal hauled by train from Appalachian coal fields to ships bound for world markets. The $18-million upgrade, completed on schedule over a 90-day period beginning in August, involved major overhauls of the facility’s dumper system, which transfers coal from rail cars to a conveyor system, and its two loaders, massive rolling structures that deliver the coal to the ships. The dumper system consists of two pairs of dumpers, each pair handling two coal cars at a time, that rotate the cars 135 degrees and dump their contents into a conveyor system that transports the coal to the pier. The upgrade consisted of replacing the structural steel that supports the north set of dumpers and the hopper bins that funnel the coal onto the conveyor belts. The dumpers, at 500,000 pounds each, were lifted by cranes and placed on the ground. While the steel support structure was being replaced, the dumpers also received a complete electrical and mechanical overhaul. The south set of dumpers will receive the same upgrade in the spring of 2013. New solid-state drives replaced the generator sets on the north dumper car pushers, which push loaded coal cars into position to be hoisted up onto the dumpers. Concurrently with the dumper overhaul, both loaders received complete electrical overhauls, including replacement of the main generator sets with solid-state drives and new power transformers and control and monitoring systems. The loaders received other significant overhauls, including a new braking system for their numerous moving parts. The upgrades coincide with the 50th anniversary of Pier 6, which began operations on one loader in December 1962. The second loader came on line in the Spring of 1963. Norfolk Southern is planning an anniversary celebration in April 2013. Pier 6 has an annual throughput capacity of 36 million tons of coal. With both sets of dumpers and both loaders operating, Pier 6 can handle up to 8,000 tons of coal per hour. It takes an average of 30 hours to load one ship with a typical load of 80,000 tons. In January 2012, Pier 6 loaded a record 159,941.45 net tons of coal onto a ship bound for China, completing the job in less than 48 hours. Much of the coal handled by Pier 6 is metallurgical coal, prized worldwide by steel manufacturers for its high-BTU and low volatile content, but has the capacity and capability of trans-loading thermal coal to the world’s coal fired power plants as well. Received the following via email dated 11-27-12. 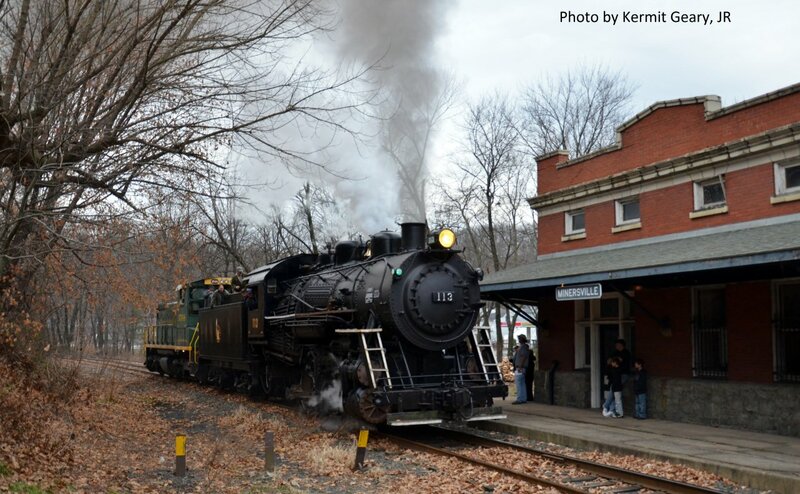 Both the Tri-State Railway HS and Jersey Central Chapter of the NRHS have cancelled the annual "Santa Claus Trains" due to Hurricane Sandy. The explanation is as follows The cancellation is a result of the effects of Superstorm Sandy and the damage sustained by New Jersey Transit to their equipment and facilities. They have determined that they are unable to provide service for this year’s Santa Train. More information can be found on their respective websites. 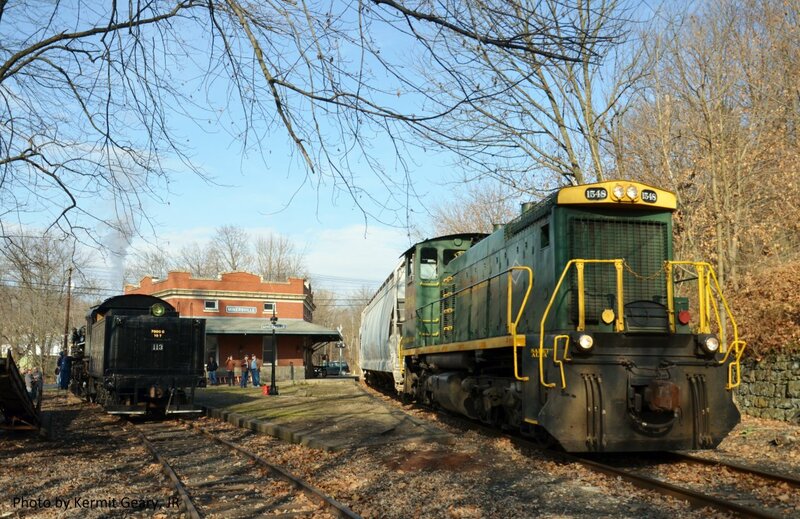 Richmond and Norfolk, VA – Norfolk Southern Foundation is continuing its generous support of The Nature Conservancy and its restoration efforts in the Dismal Swamp with a new $25,000 grant. The funds will help The Conservancy and partners install two water control systems and identify the most effective way to manage water flow in the swamp to reduce the threat of intense peat fires like the ones that threatened the region in 2011 and 2008. Costs related to the 2011 fire and another in 2008 totaled more than $20 million combined, underscoring the need to restore the water that has been drained from the swamp through ditches – some 200 years old and dug under the direction of George Washington – and to actively manage water flow in the swamp. This project will complement the pending installation of several other water control systems in the refuge and in Dismal Swamp State Park to the south. The 112,000-acre Great Dismal Swamp National Wildlife Refuge was created through a donation to The Nature Conservancy from Union Camp Corporation in 1972, and this project demonstrates The Conservancy’s long-term commitment to finding solutions and lasting benefits for people and nature. The Nature Conservancy is a leading conservation organization working around the world to protect ecologically important lands and waters for nature and people. The Conservancy and its more than 1 million members have protected nearly 120 million acres worldwide. Visit The Nature Conservancy on the Web at www.nature.org. BR&W's #60 on the "Santa Express"
November 25th marked the start of BR&W's "Santa Express" trips. 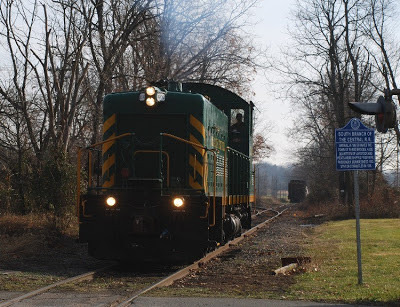 For five Sundays, they will be running three trips ((11AM, 1 PM and 3 PM) from Flemington to Ringoes (NJ). Sunday's inaugural run would be the only run that was powered by #60. The remaining four dates will be diesel powered. It is seen here passing by the former Bemis Polyethylene Packaging Company in Flemington. 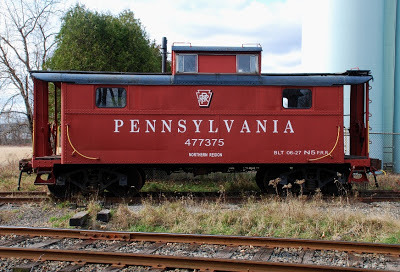 Parked on the siding was a Pennsylvania RR caboose 477375. Details about this caboose are unknown. Only twenty-nine shopping days left until Christmas! Checking out what might be running on the Lehigh Line the day after Thanksgiving via the Internet, I saw that NS 290 had UP 7714 as its leader. Reading a few more threads about this particular train's location, I would learn that it was passing through Hershey (PA) around 8:30 AM. Hmmm... knowing that I decided a trip out to Bloomsbury to photograph it as it started to climb over the "Jersey Barrier", more commonly known as Musconetcong Mountain, was a good way to take advantage of this sunny November day. Arriving in Bloomsbury I thought it wouldn't be all that long before I heard the sound of 290's horn blowing for the Kennedy Road grade crossing. One hour passed by, then two, still another half hour would pass and I started toying with the idea that if it didn't come by high noon, I would be out of there! Seven minutes to noon and a train's horn was heard off in the distance. Was this 290 or another train? I thought that since I waited this long what was a few more minutes? As the leader approached, I could see that it was 290 with UP 7714 on the point. Granted the sun wasn't as good as it would have been earlier this morning. So I will ask you to be the judge and jury if my wait was worth this image? 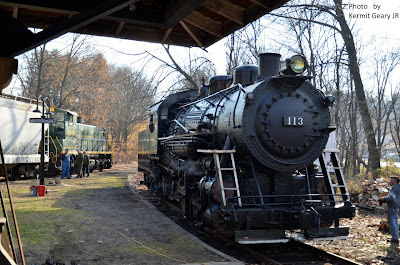 Today, 11-23-2012 aka Black Friday, also marked a milestone in the CNJ 113 project run by Robert Kimmel and the many dedicated volunteers of the Project 113. 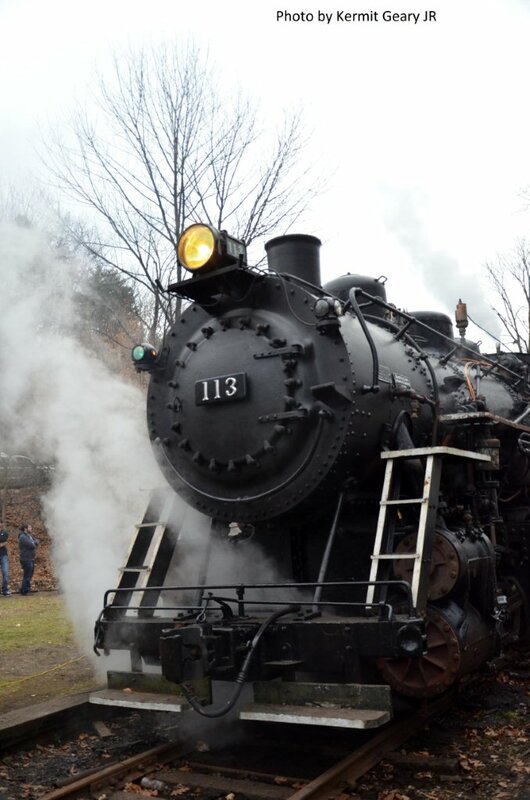 After a number of days of final preparations, the 113 was fired up and ran on a road test. 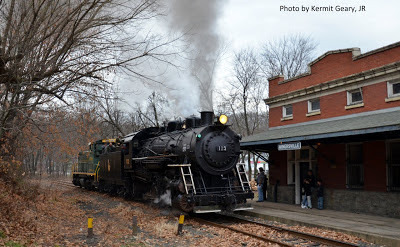 Using a Reading & Northern SW-1500 for weight and braking purposes ( provided by the good graces of Andy Mueller), the 113 gently eased backwards off the Wolf Creek Branch and out onto the Minersville Branch. Once out on the main, she continued down to Mar-Lin where a quick inspection was done to make sure that all was in working order. Two toots on the whistle (recreated from the original design by Bernie Perch for the Project 113) and the 113 returned to Minersville. Once clear of the Wolf Creek switch, Engineer Shane Fredrickson opened her up for the run past the Minersville Depot. 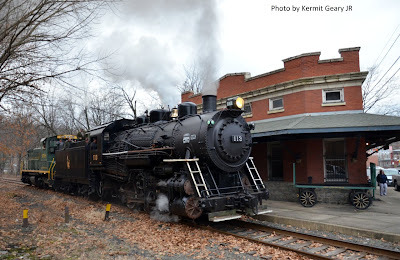 The sight and sound of her blasting through Minersville and across the Sunbury Street crossing was an awesome experience to behold. A BIG thank you to the Reading & Northern for allowing this event to occur and also a BIG thank you to the crew and volunteers of the Project 113 for allowing us to be able to see the 113 operate with all her glory in 2012. The Project 113 is a non-profit 501(c)3 organization that depends on volunteers and donations to succeed. They produce a Black & White calendar featuring vintage photos of Reading, CNJ, and LV operations in the Pennsylvania area. They are available for a $5.00 donation plus postage from : Project 113, 113 East Sunbury Street, Minersville, PA 17954. 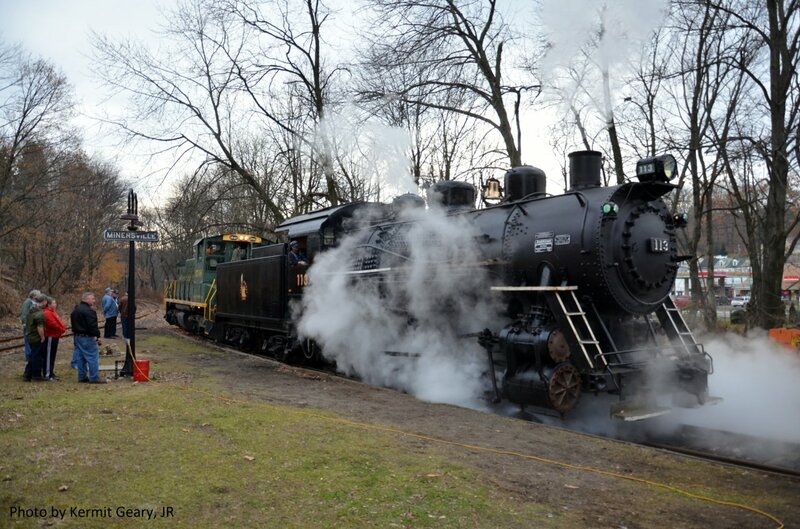 While you are ordering a calendar, please consider making an additional donation to assure the operation of the 113 for public events in 2013!! !